The day we’ve been waiting for since WWDC is here, Apple Music is here. Its brought some OS updates in tow, iOS 8.4 and OS X 10.10.4. What does the new service and updates offer, let’s take a look. Apple Music is Apple’s take on Spotify or Rdio based on Beats DNA. Instead of being its own service, it’s baked into the iOS Music and OS X/ Windows iTunes Apps. The iOS app came with iOS 8.4, but an updated iTunes had yet to show its face at the time of publication. Apple Music will also be showing its face on your AppleTV and on Android devices later this fall. 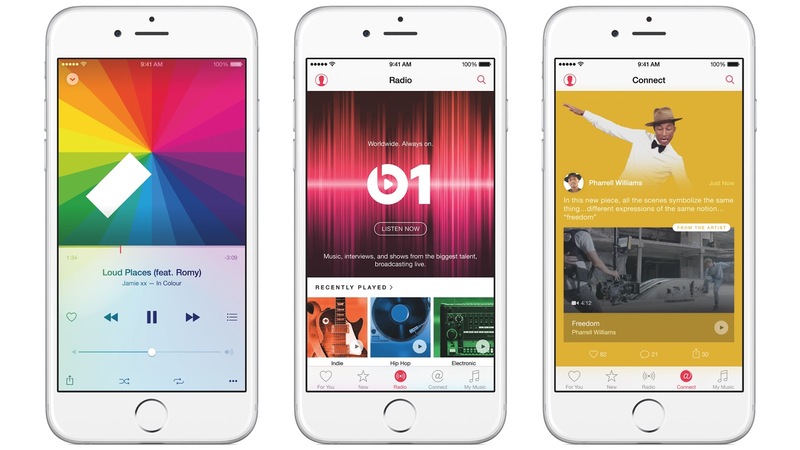 Apple Music is based upon 3 main sections of content: Streaming music, Radio, and Connect. Streaming music is much like Spotify where you get unlimited streaming access to a large collection of songs. You also get offline access to Apple’s music and iCloud access to yours. This includes not only large national acts, but after also a good deal of up and coming or lesser known bands. The second area is Radio which includes a live Radio station called Beats 1 with DJs and shows. There are also much improved and curated Pandora-like Radio stations based on artists and genres. Lastly, you have Connect which, is half artist-blog and half social network. I won’t lie, I’m a bit skeptical about this part. Apple Music is $9.99 for individuals or $14.99 for families via iCloud family. Either way, you have 3 free months on Apple’s dime to figure out if you want to pay for it. Since Apple Music is replacing its Beats counterpart, there was some question about what will happen to Beats. Beats Music will stay open for a few more months during the changeover. If you don’t have an Android device and want to move over right now, Apple Music will incorporate a user’s Beats Music playlists and settings. Update: iTunes 12.2 for the Mac has been released. iTunes for Windows still shows version 12.1.2 with 12.2 listed as "coming soon". iOS 8.4 isn’t just about music. iBooks also received a fairly substantial update. The biggest is the ability to find and play audiobooks. For digital books, you can discover books by their series and pre-order them. Lastly, iPhones can now view iBook author-designed books. They could previously be only accessed on iPads. There are a couple other fixes as well like fixing the unicode crash, a bug fix for Apple Watch apps reinstalling themselves, and better compatibility with GPS accessories. Update: To help better create books that work on the iPhone, an update to iBooks author for the Mac has also been released. OS X 10.10.4 can be summed up in one word: reliability. The update fixes issues with networking, migration assistant, support for external displays, and syncing photos both with iCloud and the now replaced Aperture and iPhoto. As part of the changes for networking Apple has removed the discoveryd process that was introduced in Yosemite and has been a bit of a nightmare. Overall though, 10.10.4 is a very much a bug fix release with no real updated features. GarageBand for the Mac has been updated to version 10.1 with support for sharing to Apple Music's Connect. The Mac version also gains Force Touch trackpad Support for use on the new 12" MacBook and 13/15" Macbook Pros. For fans of EDM, Hip Hop, and a few other styles, there are over 100 new synth patches, 10 new drummers, and 1000 loops added to the GarageBand library. The synth patches also support TransformPad sound morphing technology almost certainly based on technology from Camel Audio which Apple bought earlier this year. Apple Music looks like it’s going to be a good one. The library is huge and the radio function so far is great. Expect a full review from the [Tech Hangout](http://www.TheTechHangout.com in the next week or two.